​Set in a lonely Irish cottage in Galway in the 1920's, an old lady ruminates over her fate and looks into her past as well as her uncertain future as she faces eviction and a move into the local workhouse. The play began life as a short sketch performed at the London Irish Centre in November 2016 and is being developed as a longer drama. The play is inspired by Phil Mason's play about Lady Gregory which successfully toured Ireland in 2015 directed by John Dunne and starring Maura Judges as Lady Gregory. Much is known about the visits Michael Collins made to London as part of the treaty negotiations in 1921/22. However, much less is known about the nine years he spent in the capital working, at all places, at the Post Office Savings Bank. Lodging with his elder sister Hannie, Collins was fifteen when he moved to London where he remained until his call back to Ireland for the Easter Rising. This two- handed drama explores the years prior to 1916 and of course the time when he returns to London a totally different man altogether. Set in a North London Irish pub, Teresa is holding a wake for her dead husband. Her Celtic Tiger son is helping, alongside a Romanian barmaid. Their lives ravel together as preparations for the wake progress, aided and abetted by numerous bumps in the night! Sorry, another wake play!!! The play premiered at the London Irish Centre then later at the Lion & Unicorn, Kentish Town (Oct/Nov '17) starring Fiona McGohren, Rafaela Elliston and Robbie Martin. The last in the Cooley Trilogy (see also LONG WOMAN'S GRAVE and THE CURSE OF MACHA) which features cousins Jack and Mary. The latter has kidnapped her late father's coffin and is holed up in a lonely cottage in the Cooley Mountains. Matters take a spooky turn when the ghosts of both mothers turn up to try and resolve the many issues which the body snatching has thrown up. The problem with this pair of ghosts is that nobody can see them! 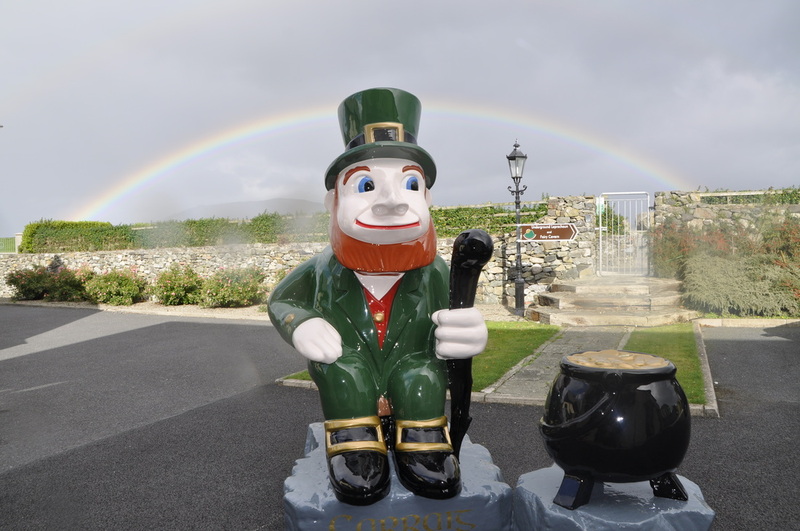 Adapted from the book by Kevin J Woods, The Last Leprechaun traces the history of leprechauns from the beginning of time to the present day. Cooley man McCoillte stumbles upon three leprechauns who want him to help them save their clan, and indeed the leprechaun race which is in decline. In relating their history they take McCoillte on a magical journey through different periods of Irish history interspersed with mythical stories of Ireland. The facts of the Great Hunger in Ireland are well known. A million died and a million left for the New World over a four-year period. All this against a background of food being produced and exported to England. On top of that landlords also took the opportunity to rid the land of troublesome peasants. This is the story of a family caught up in the struggle to survive. The play explores the effects of the 1879 famine on the lives of Belfast people who had to cope with the influx of refugees from the country desperate to escape to a better life. A Belfast boarding house is turned into a hostel for destitute women caught up in the famine. Run by the boarding house landlady, a disillusioned priest and a reformed prostitute, the aim of the hostel is to get women to go out and help the poor and destitute. first presented at the King's Head in London. Annie's marriage to Orangeman Billy is on the rocks and an unexpected visit from English catholic Dave, who she hasn’t seen since her teens, brings matters to a head in an explosive manner. Annie’s brother Macca also has his own journey to make, as he has to choose between his best friend and his unionist allegiances on the one hand, and his familial loyalty to his sister on the other. 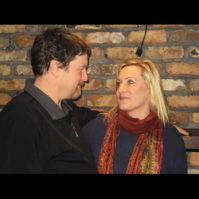 The latest production features Heidi Stewart and Roger Dane in their 2014 Ireland tour. Taken from the Ulster Cycle of Irish myths and the An Tain legends, the play consists of two inter-linked dramas, each exploring key figures familiar to Irish audiences. 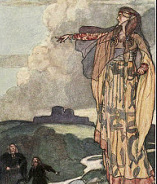 The first features two of the Morrigan sisters, and the second is an account of Queen Maeve's desire to capture the Brown Bull of Cooley. Both plays offer an insight into Irish mythology. The play premiered in Belfast in 2013 before embarking on an Ireland tour playing at venues in Kilmallock, Newtownabbey, Kilkee, Ballina and Derry with Denise McGeown and Catriona Loughlin (pictured). A second generation Irishman returns to the land of his fathers for a period of peace and tranquility and general healing of the soul. His peace, however, is disturbed when characters from a local legend visit him in his lonely but idyllic cottage by the sea. A semi-biographical play populated by larger than life ghosts from a distant past. The first in a series of plays set in the Cooley Mountains, Co Louth. A re-telling of the An Tain legend taken from the Ulster Cycle. Queen Maeve desires the Brown Bull of Cooley and after an unsuccessful attempt to obtain the bull by peaceful means, she decides to mount a cattle raid which turns into a bloody war which she cannot hope to win. Other characters in the play includes the Irish legendary hero Cuchulainn. The second in the Cooley Trilogy series of plays. The Cooley Trilogy continues with a return of Jack, the second generation Irishman of Long Woman's Grave who is now a successful playwright in Dublin. He returns to the cottage by the sea only to be met by Macha, one of the Morrigan sisters, who has decided to live as a mortal. Later, she is to inflict what is to become the imfamous Curse of Macha which afflicts all the men of Ulster before they go into battle.